Hitting both ends of the performance/ efficiency spectrum. 2017 BMW M550i xDrive For sale Series - BMW is expanding its 5 Series range in the United States by adding new models at both ends of the performance/ efficiency spectrum. We'd love to tell you that one of them is the new M5, but it's not. At least has still not been. Fortunately, the M550i xDrive sounds like the next best thing. Powered by a TwinPower Turbo 4.4 -liter V8 engine with 456 horsepower at 5,500 rpm and crest torque of 480 pound-feet starting at simply 1,800 rpm, BMW responds the M550i xDrive is the quickest 5 Sequence ever attained. Indeed, the model's 0-60 meter of" under four seconds" means it's quicker than the previous-generation M5. All that power is sent to all four pedals through an eight-speed automatic transmission. A rear-biased torque dispensation "ve just got to" shape the M550i somewhat fun to drive, too. 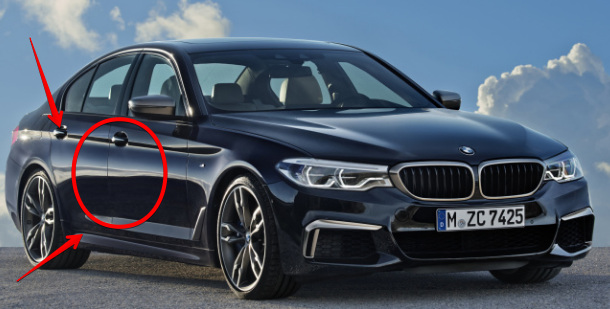 It sits 10 millimeters lower than other 5 Series models, and the various types electronic dangling determines are tuned by the experts at BMW's M division. If overt power isn't your thing, the BMW 530 e iPerformance may be more your accelerate. It's a plug-in hybrid powered by an electrical engine with 95 hp and 184 lb-ft, paired up with a 2.0 -liter turbocharged four-cylinder with 180 hp and 215 lb-ft. Mixed, the vehicle's 248 ponies and 310 lb-ft are enough to push this 5 Sequence to 60 in 6.1 seconds. The liquid-cooled, 9.2 kWh, lithium ion battery pack is positioned so that it doesn't take up any trunk opening. xDrive all-wheel-drive is optional. Both of these new 5 Series models will go on sale in the spring of 2017. Pricing and effectiveness people have yet to be announced.